John Piper and his team from Desiring God have released a free book addressing the question…Does God have a good purpose in my disability? In Disability and the Sovereign Goodness of God, John Piper explores what the Bible has to say on the topic of disability. The book is intended to be a resource to assist church leaders everywhere confronted with difficult questions pertaining to disability, and to challenge the church to consider how we’re called to respond to persons with disabilities and their families. The book consists of four sermons offering an in-depth examination of John 5:1-18 and John 9:1-38, along with an interview John conducted with John Knight, a blogger who writes of his firsthand experiences as the parent of a son with blindness, autism and cognitive impairments. The book is a great free resource and I’d very much encourage our readers to share the link with pastors and church leaders everywhere. The folks from Desiring God are also putting on a one-day conference, The Works of God: God’s Good Design in Disability on Thursday, November 8 in Minneapolis, featuring Nancy Guthrie, Greg Lucas, Mark Talbot and Reverend Piper that’s definitely worth checking out. 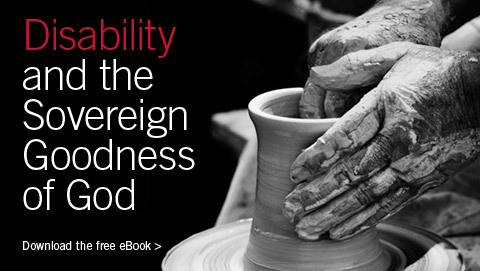 This entry was posted in Inclusion, Resources and tagged church, Desiring God, Disability and the Sovereign Goodness of God, Disability Ministry, God's Good Design in Disability, Inclusion, John Knight, John Piper, The Works of God. Bookmark the permalink.